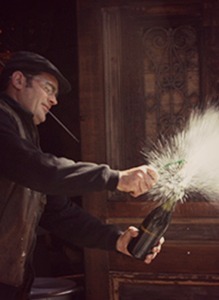 H amish has winemaking in his blood. His great great grandmother was South Australia’s first female winemaker and his vineyard is one of the oldest in the region. Working alongside his father they created Hillstowe wines in 1991 which became a successful international brand. When they sold this in 2001 the opportunity arose for Hamish to build his own winery. Joined by Kate later that year, they have never looked back. Hamish is chief tractor driver (and fixer), disgorger, equipment handy man and blending partner when not running every other aspect of the business. You might see him around the traps conducting tastings and generally amusing the crowd with his funnies. 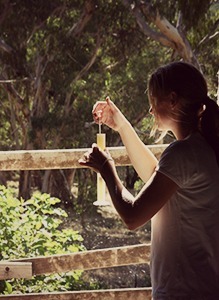 Kate was 19 when she realised that becoming a winemaker was actually a ticket to her other passion... all things French. This is how she ended up in France pursuing her dream studying at the Lycée Viticole d’Avize in Champagne. Nearly 3 years later, with lots of bubbles in her belly, she returned home to her family winery Stone Bridge in WA for 4 years before joining Hamish in 2001. Was it fate or destiny that Hamish was a vigneron in the Adelaide Hills? Ah, whatever. The result is all that matters, as the region has proved ideal for her to hone her sparkling style here with some of the best fruit the country produces.